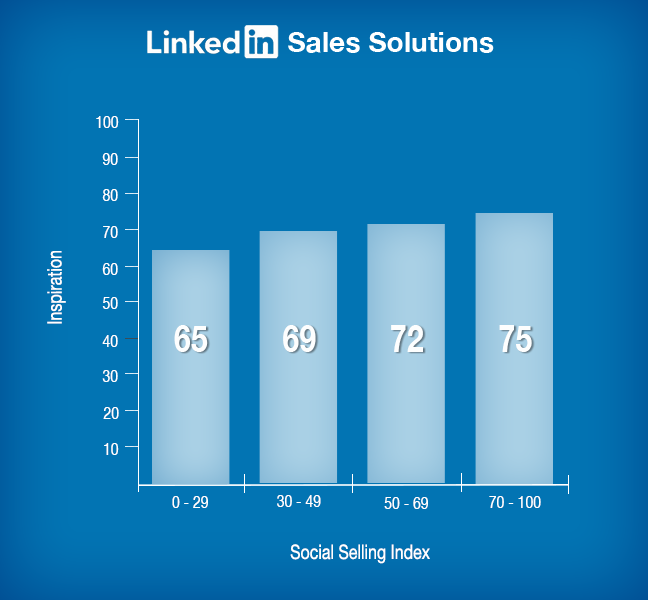 A few months ago, we posted about the Social Selling Index (SSI), a first-of-its kind measure of your company’s adoption of social selling practices on LinkedIn. (Learn more about LinkedIn’s SSI here). Our research shows that SSI correlates to actual sales performance. But how does success in social selling relate to how inspired these people feel? We asked 100,000 professionals how often they felt inspired at work on a scale from 0-100, and 14,000 of those that contributed were B2B sales professionals. The SSI measures your performance based on these 4 activities on LinkedIn: create a professional brand, find the right people, engage with insights and build strong relationships. Each activity is measured on a 0-25 scale, then summed into an SSI score. 1. Sales professionals with high SSI scores feel more inspired at work. 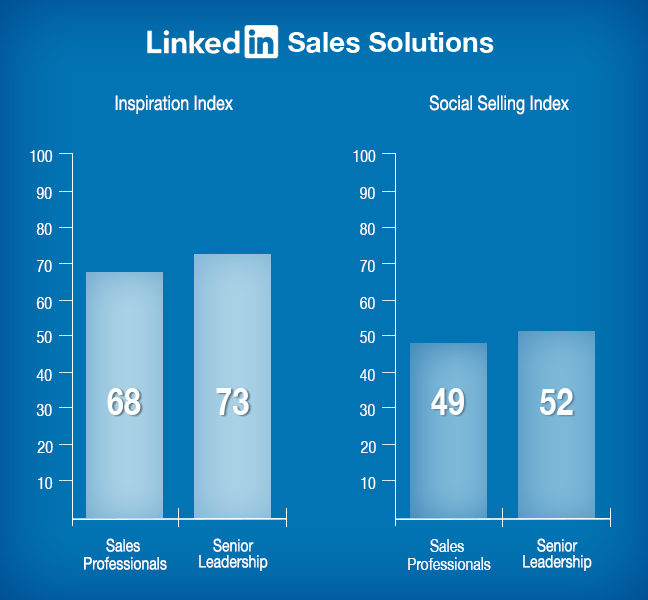 Sales professionals with an SSI score between 0-29 rate themselves an average of 65 on the Inspiration Index. Sales professionals with an SSI score between 30-49 rate themselves an average of 69 on the Inspiration Index. Sales professionals that adopt social selling are 51% more likely to exceed their sales goals, and feel that they are more likely to build strong and meaningful relationships on LinkedIn. 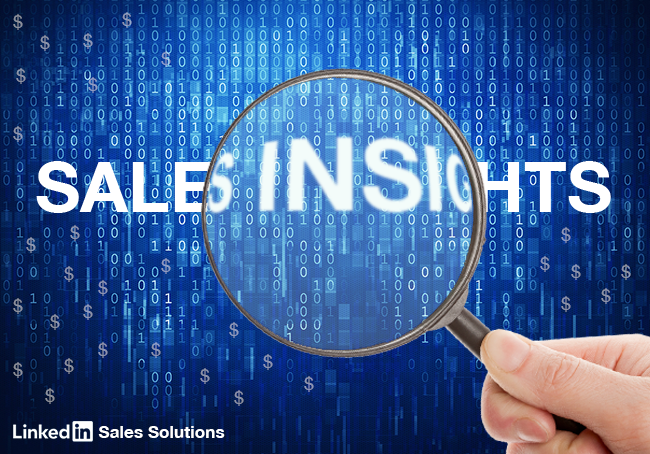 The data proves that sales reps with a high SSI score feel more inspired at work. (NOTE: This graph includes all sales professionals including Director+ levels). Senior leadership have an average inspiration index of 73 and an average SSI score of 52. Sales professionals (not including senior leadership) have an average inspiration index of 68 and an average SSI score of 49. Because sales leadership have a high SSI and Inspiration Index score, they should make it a priority to train their entire organization on social selling best practices so more people feel inspired. (NOTE: A 5 point difference is significant in the Inspiration Index and SSI because we sampled such a large number of professionals). Being inspired by your work is an important aspect of having a successful career. When you’re inspired by work, chances are you’ll be actively engaged and with a high SSI score, you’ll exceed your sales quota. That being said, we are launching a campaign tomorrow called “Career Curveballs." 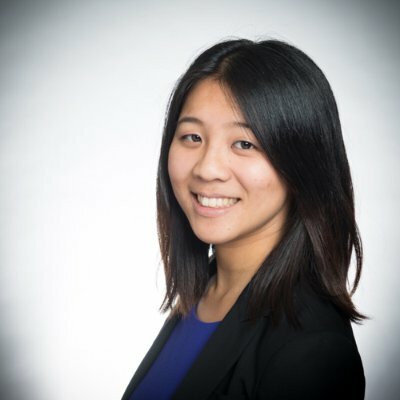 This campaign will feature surprising career twists from our LinkedIn sales experts and what they learned from their experience. Check back tomorrow to see our first story! Does Mirroring Work in the Age of Social Selling?